Home » DLSAA Chapters » What are the qualifications for a chapter? 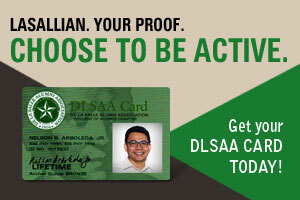 A minimum of ten (10) qualified Lasallians who are members of the DLSAA is required in forming a chapter. There shall only be one chapter per defined regional area and no 'sub-chaptering' is permitted. In order to obtain the proper control and coordination of chapters, the DLSAA requires that it be informed first of a chapter in the process of formation. Once the approval of the DLSAA is obtained, then the chapter may be registered according to the best locally suitable legal entity. A letter of application addressed to the "President, De La Salle Alumni Association" specifying the group's intention to form a chapter.